Batman Cometh: The Ercole Sword Concept? 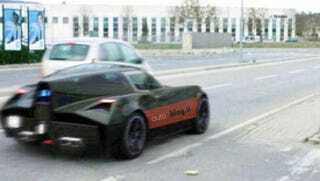 Autoblog.it has a shot of what may be a concept car built in a collaboration between Italian tuning shop Uk Garage and designer Ercole Spada's firm SpadaConcept. The former chief stylist with Zagato is responsible for the Aston Martin DB4, Alpha Romeo TZ and Fulvia Zagato Sport. This car was allegedly inspired by the Alpha Romeo TZ prototype of 1965. No word on whether it'll make its debut in Geneva, or at some VIP event at secret Italian castle in the Lake Como region. We're betting on the first one.